When I got the car I knew it was not running due to the little issue of the wiring. It was said that the bloke who had it tried to remove the air con and managed to short the wires. Quite why he ripped the entire loom out and put it in the boot is beyond me. such a shame. But on the other hand it gave me an oportunity to update the wiring and make it reliable and safe. 46-year-old wiring is not the best when it has been sitting in hot and cold throughout the year. My needs were a must before I could do anything else. Have a look and see what you think. Note the fuse is wrapped in tin foil! Dangerous and stupid. The tin foil can be seen in the other photos as well. Instead of unplugging the wires they have been cut. There was no way to salvage them. So bad was the damage that I am looking to replace the wiper motor as well as a result. All connections unplug. What possessed the man (Satan himself I expect), to cut all these wires I have no Idea. FOr the more astute of you out there you may catch a glimpse of modern wiring for a radio in there as well. If he got it going I would be surprised. If you look closely and the second picture on the top row you will see that the plastic has melted as If in a fire. I can’t see any fire damage in the car to be fair. but by the looks of it – it was a near miss. Now you can see why I had to rewire!! This was very early on as you say and some of the very first pictures I took. The first real project I did on the car was to rewire it and you can see why now. I also had Spirograph it was a great toy. I do remember getting told if for putting the little pins into the table top! 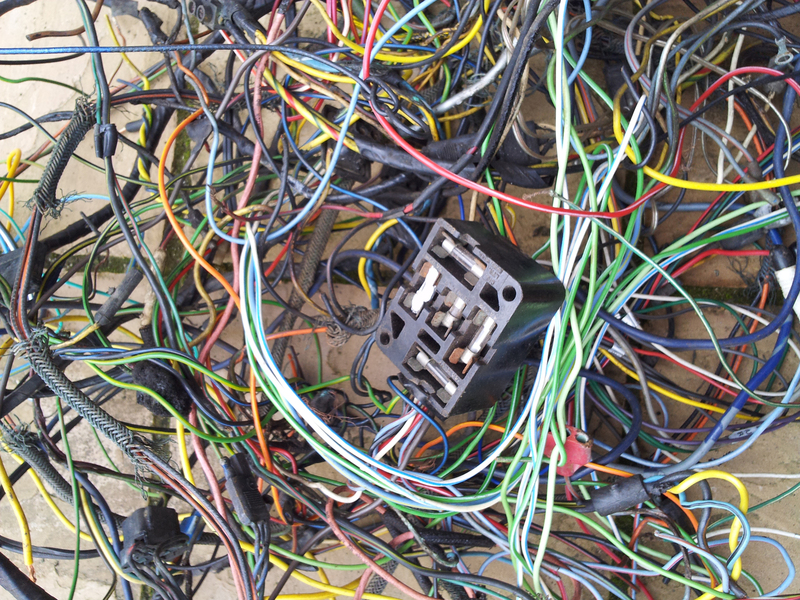 Will you be trashing the old wires, switches, fuse box, etc? I am restoring a 68′ and I’m in need of a fuse box. I can replace it with an after-market box but would rather stay original. The switches were OK apart from one so they are being used again. The fuse box I was going to take off and put on ebay as a genuine part and difficult to come buy. Please email me as I am open to offers if your interested. The switches I can’t guarantee are working but I am sure we can work something out.